For the first time since 1984 a single party will have a majority in the Indian parliament. That year, the Congress Party led by Rajiv Gandhi secured 414 seats (out of the 533 seats in the Lok Sabha, the parliament). Mr. Gandhi’s mother, Indira, had been assassinated not long before the election, and the Congress won decisively on a massive sympathy wave. It did not matter to the electorate that the Congress had engineered an anti-Sikh pogrom that resulted in the death of 3000 Sikhs in two days. The 1984 election was the Congress’ largest victory yet. In the 1984 election, the Hindu Right’s Bharatiya Janata Party (BJP) won only 2 seats. This year, the tide has turned. The BJP is projected to win a large majority, not near 414 but as decisive. It did not stop the Indian voters that the BJP leader, Narendra Modi, is accused of having a hand in an anti-Muslim pogrom in Gujarat in 2002. The Congress, led by Mr. Gandhi’s son, Rahul, has posted its lowest ever total. It will limp into second place. India will now have a powerful Hindu Right government with a very weak opposition. It is the worst of all worlds. To come to power, the BJP wiped out several major political parties across northern India – the major parties of Uttar Pradesh (BSP, SP) and of western India (including the NCP). It also decimated the Congress. How did the BJP manage this feat? The Congress-led United Progressive Alliance (UPA) has been in power since 2004. In the first UPA, the Congress’s commitment to neo-liberal policies had been constrained by a substantial Communist bloc with which it had to ally in parliament. Despite that, the Congress was able to deepen its LPG agenda – liberalization, privatization and globalization, an explosive mix that brought India in line with the planet’s rising inequality. An Indian Planning Commission study from December 2012 found that urban inequality was rising “steadily over the years, with a sharp rise in the 2000s. This rate of inequality exacerbated the condition of deprivation suffered by 680 million Indians, according to a study by McKinsey & Company. The McKinsey study suggested that the “empowerment gap,” namely the additional consumption needed to bring the deprived Indians to the “Empowerment Line,” is seven times greater than the cost of poverty elimination. The Congress led government fell short not only of bringing the population to the poverty line (which is very low), but it was no-where near providing an agenda for the 680 million who were below the Empowerment Line. The policy slate of the Congress-led UPA intensified inequality, allowing a narrow slice of the Indian population to accumulate vast amounts of wealth and another slice to benefit from the expenditures of this small moneyed elite. Policy options that sought to enhance the entrepreneurial class as the engine of growth also provided that class with the mechanisms to benefit through corruption. The number of scandals that rocked the second UPA government (2009 onward) began to define the administration of Dr. Manmohan Singh. By the time the Indian electoral went to the ballot, they saw the Congress as the party of corruption. That was something that the incumbent party could not shake. Modi was able to dodge questions of the “Gujarat Model.” He was quickly anointed by the BJP as its Prime Ministerial candidate and hastily favored by the media with far more coverage than any other politician. 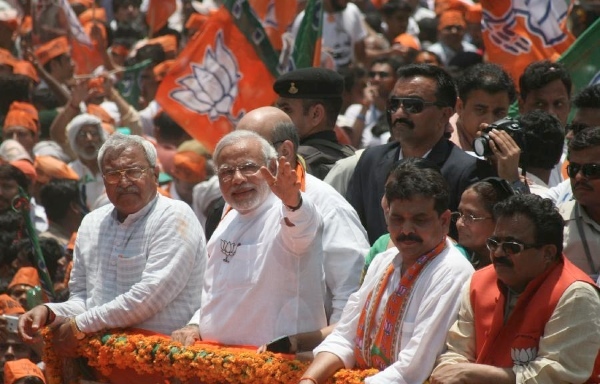 Modi ran as the development candidate with a carefully calibrated argument – he suggested that it was not neo-liberalism that created inequality, but its symptom, namely corruption, which the BJP tied to the mast of the Congress. In other words, the BJP never ran against the roots of inequality or deprivation, but only what it deemed to be its symptom – corruption. This was a clever strategy. It both rode the anti-Congress wave, which had been produced by anger at the inequalities in the country, and it mollified the corporate community, which would not have been interested in any criticism of the policies of neoliberalism. Unlike the rest of the BJP leadership, Modi had no need to take recourse to the language of the Hindu Right. He had been the Chief Minister of Gujarat during the riot, and despite no finding of guilt has worn the odor of responsibility. A man of the Right, Modi simply had to gesture toward his base to comfort them about his commitment to their ideology and demands: it was sufficient to journey to the headquarters of the powerful Hindu nationalist organisation called the Rashtriya Swayamsevak Sangh (RSS) – the brain center of the Hindu Right – was one indicator, and to deliver his wink and nudge speeches about Muslims and their need to be Indian. He did not have to ride on the chariot of the Ram Temple in Ayodhya, although not one of his hard right supporters doubted his commitment. It freed Modi up to be the pro-Business leader rather than the anti-Muslim one. It was a campaign run with a masterful touch. Modi will form his government in the weeks to come. He will have to decide whether he governs from the ideology he concealed in plain sight or from the campaign rhetoric of good governance that he delivered. If he does the latter, he will be able to cement the BJP in power for a considerable time. If he does the former, his will be the last BJP government in a generation. The weakened secular opposition in the Indian parliament will have to ensure that rights of minorities are protected, that jingoism is combated, that full-bore neoliberalism is prevented, and of course that an alternative view is heard. The Congress is currently unable to do this, and most of the other major parties are too weak to mount any effective challenge. The Left has also been considerably weakened, and will have to build its strength outside parliament through popular political struggles. Did the Indian people get what they wanted with this election, where 66% of the electorate voted in the BJP in a landslide? At one level the people get what they vote for – but on the other, did they vote for good governance or Hindu nationalism? It seems to me that they voted for the former. It would be characteristic of the BJP – and desolation for India – if they believe that the people voted for Hindu nationalism. People voted for good governance and Indian nationalism( not Hindu). Indian nationalism has been destroyed by the pseudo secular parties for the last 65 years for the sake of vote bank politics. India being a secular democratic nation, all of it’s citizens should be subject to a common civil law and not any religious law.That’s what BJP should ensure side by side good governance and development. BJP should ensure minorities get opportunity to enjoy all of the rights that the majority enjoys. BJP should also ensure no one gets any special privilege for just being a minority. 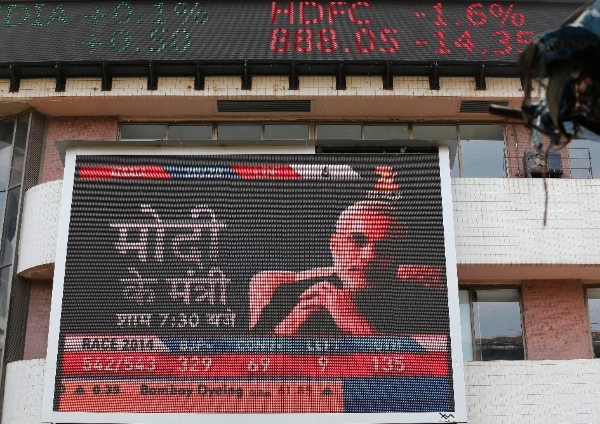 The Indian stock market hit record highs on the news of the BJP victory. What do we infer from this? And is there any analogy between the rise of the BJP, and the rise of Right Wing parties in the west? Oh, the humanity…wouldn’t someone please think of the leftards like VP? I’ve been waiting for this moment for a decade. The continuous cacophony of lefty butthurt at Modi’s rise has been the best part of this decade. Keep ranting, mofos : the more you rant against Modi and BJP, the stronger our resolve to win against you. For now, luvin’ it…burn, you fskrs! Got my popcorn out – and my checkbook ready with a contribution to BJP – for when Arundhati Roy produces her first polemic. Very good and accurate analysis by the writer which is definitely acceptable to all Indians except for the Right-Wingers. The revival of Nazism is global, sadly. It might not all derive from the German Nazi experience, but does imitate it in too many respects. Golden Dawn, Indonesia, Israel (yep! ), rightwing parties in Europe. The West has never had a problem with Nazism and fascism (essentially the same thing, with historical differences), as we know. Now, with the Ukraine situation (where the rehabilitation of Nazism is having it’s greatest success), the West is playing a dangerous game by allowing it’s master, uncle Sam to make moves that America schemers think will forestall the natural evolution of a Eurasian bloc that ‘includes’ Russia. Can’t have that. They have always feared that because they have always been determined to dominate the US-designed and fossil-fueled, global capitalist system post World War II. In a normal world in which leaders cared about themselves and their people, they wouldn’t always be planning to devour or planning for attempts to devour them. But here we are. There’s only the kind of cooperation you see among crime families of the conventional sort. It’s not based on principle and for the purpose of conducing to a safe and secure world for ‘all’. Any beastly corporatocracy state at any time, if the opportunity arises, is capable of devouring a weaker state – and stealing it’s resources. And so, with the great game (within a greater game of ‘riches for the strongest’) on, uncle Sam needs us to support him by going along with the evil commie Putin line, which make the Nazis in Ukraine into good guys. Our ‘leaders’ also think this evil is cool. “Worst of all worlds”? Please … Worst for who? You? or all the people that voted for them? Faisal Khan dies of sickness, Salim Khan got married and lived in to Kashmir, and that same Salim Khan is ancestor of Farukh Abdulla and Omar Abdulla who is with Congress all the time. Now talk about Ghazi Khan who fought the election but never won, after the death of Ghazi Khan Moin Khan changed his name and became Motilal Nehru, he fought the election but never won ether. so when the partition occurred public wish to make Sardar Patel PM but Ghandhi supported Nehru and he became a PM that’s why Nathuram Godse killed Ghandhi.